This week Volkswagen debuted their new Beetle concept car, the E-Bugster, at the 2012 Detroit Auto Show. I've been a fan of VW Bugs since I was a kid. It's the only car I ever wanted. When I could afford to buy my own car, I bought a yellow Bug and tricked it out Transformers style. Because we all know Generation 1 Bumblebee was a Beetle (classic). The E-Bugster is a pretty slick looking car. It's a two-seater, drop-top sports car! What's even more awesome is the side decals on the door. The cutout lettering with pin stripe detail is totally what I designed for my Bumblebee! So yeah, my car just got that much cooler (because it isn't enough that I drive an Autobot around everyday). Anytime Volkswagen comes up with a new concept for the Bug, I'm always on the fence. 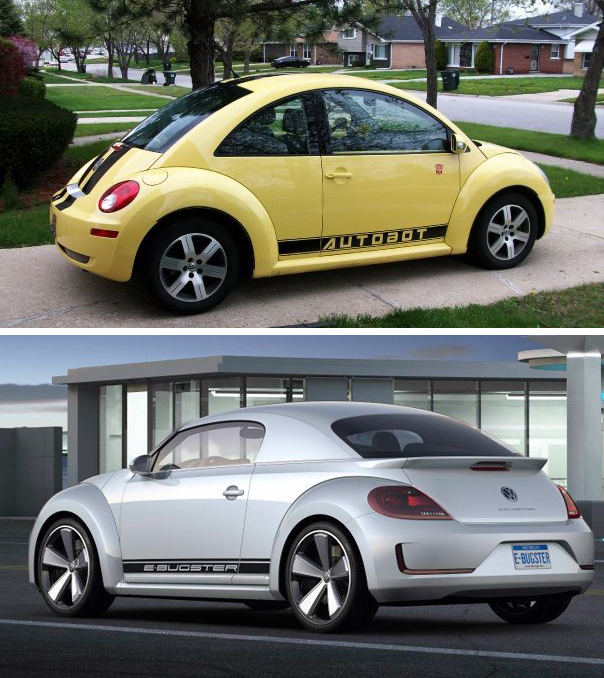 I wasn't a fan of the 2012 Beetle, because the hood was longer, and the profile of the car resemble more of a standard car than the spherical Beetle. I just hate to see VW stray away from the qualities that make Bugs unique. I like my cars curvy, fun, and with personality...just like me! It didn't take me that long to warm up to the look of the E-Bugster, though. Check out the official E-Bugster video from Volkswagen!